Tucson Museum of Art ADC Holiday Show, November 16-18, 2012. Click image to view event web page. Several of Larry Gotkin's works will be available for sale at the Arizona Designer Craftsmen Holiday Show at the Tucson Museum of Art on Friday - Sunday, November 16-18, 2012 from 10am - 5pm. 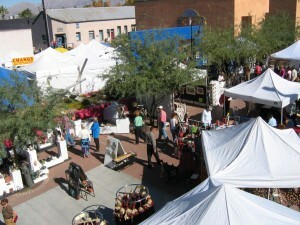 More than 100 of the Southwest’s finest artisans will display their wares and help you find the perfect holiday gifts. Both the Market and Museum are FREE and open to the public all three days. There will also be a beer garden sponsored by 1702, Nimbus Brewery, and Dragoon Brewing Company. Look for Larry Gotkin's ‘edgy’ art for sale at the ADC TENT. Meet Larry in person from 10am-noon and 3pm-5pm on Saturday, November 17, 2012. Larry will have additional items from his inventory on hand during his appearance. Don't miss this chance to meet Larry Gotkin, see his beautiful work, and talk with him about how he creates these one-of-a-kind pieces. This is a very big show! Stop in and stock up for your holiday giving, or find something special for your own art collection. Show Dates: Friday, November 16, 2012 - Sunday, November 18, 2012. Show Hours: 10am to 5pm. Larry Gotkin Personal Appearance: Saturday, November 17, 2012 from 10am-12 noon and 3pm-5pm.